It has been a long time since I updated this blog, but I have been reading Julian every day and so am several translations behind. The subject of this blog post is my fourth Julian, but third complete translation, since my very first was the book of excerpts, Enfolded In Love. I read it before the summer and finished it just before I was received as a Companion of Julian. This is a big book; as its title suggests, it is a vast work, and clearly the result of a great amount of research. 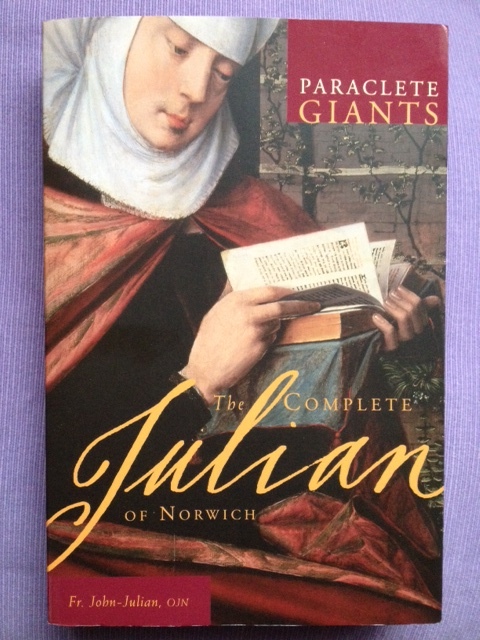 Fr John Julian is the Founder of the Order of Julian of Norwich, and according to the information on the back of the book ‘has read and studied Julian of Norwich every day for over quarter of a century’. This ‘Complete Julian’ contains the full text of the long version of the Revelations (but not the short version), as well as a lot of other information. Since I am reading only translations at the moment, I have only read the translation part of the book and can only comment on that for now. The book is arranged as follows: (1) Introduction and major themes, (2) All about Julian, (3) The Revelations with annotations, (4) Appendices and (5) Notes, sources and recommended reading. Out of four hundred and fifty pages (3) takes up pages 62 to 375. This may seem like a very long, long version, but it is annotated and is arranged with the translation on the right and the notes on the left. I really wanted to like this translation. I was excited to order it, and was looking forward to reading it. In the end it just didn’t work for me, and the way I read Julian. I read two chapters of the Revelations every night. I have found that I ‘hear’ Julian’s voice more clearly if I read aloud, and often underline parts as I go. It helps me to focus on every word. So, what is this translation like, and why didn’t it suit me? I have never studied Julian in the original medieval text, but I imagine that this translation is close to the original. The translator’s note in the Penguin Classics version (My second Julian) makes mention of a looser translation, at least as far as paragraphs are concerned. In Fr John Julian’s translation, there are many short paragraphs, a large number of which start with conjunctions, one of my personal pet peeves. Unlike other translations I’ve read, all personal pronouns relating to Christ are capitalised, which makes for quite a riot of uppercase. The closeness to the original text, and the (I assume) resulting decisions regarding punctuation made it hard for me to read smoothly. I also found the annotations distracting. Sometimes they were helpful, but sometimes I found them patronising in their stating of the obvious (“Julian’s term Fiend is simply another word for ‘Devil'”) while in others I felt there was a bit of academic score-settling going on (“W & J mistakenly translate this”). I am not a fan of the use of archaic language, and found the use of ‘thou’ irritating. I know that it’s the familiar form of the second person pronoun (and grew up in a part of the UK where it is still used), but for me it gets in the way of connecting with Julian. I also must admit a personal horror of the word ‘dearworthy’, which I have only seen in translations of Julian. I squirm every time I see it. So, who is this book for? That is what puzzles me most. Is it for people who already know Julian’s writing? Is it to inform someone about all things Julian? For me it feels like a very thorough textbook, Medieval Mystics 101 and beyond. I certainly don’t think the annotations lend this to being a translation to meditate on, there’s just too much distraction. I think, in the end, my discomfort with this book is that it feels so scholarly. I don’t feel Julian’s voice, her energy, her determination to be heard, coming through. Her words have been pinned down so much that there’s no room to breathe. I read it all aloud, and I found it hard to read, it didn’t flow. I often had to go back to the beginning of a sentence and start again. I didn’t underline anything. I felt disconnected from Julian and was actually glad to finish it. Having said all that, I am looking forward to reading the other parts of the book, I hope I connect with them more easily than I did the translation. It is an impressive-looking book, but I wouldn’t recommend it to anyone unless they were studying Julian from an academic point of view. This entry was posted in Editions of Julian's writing and tagged Companion of Julian, Elizabeth Spearing, Fr John Julian, Julian of Norwich, order of julian of norwich, Revelations Of Divine Love by tokyopurplegirl. Bookmark the permalink.